Cut the meat into 2cm dice. Put it in a pan with cold water and bring it to the boil. Rinse under cold water and drain. Put the meat back in a clean pan and cover with water. Add the salt. Add the vegetables and spices and boil until the meat is tender - about 90 minutes. Remove the meat and strain the stock to use in the dill sauce. Reserve the vegetables. To make the dill sauce, melt the butter and whisk in the flour. Add the stock, the vinegar and the sugar, followed by the finely chopped dill and the cream. Bring to boil, whisking continuously. Season to taste. 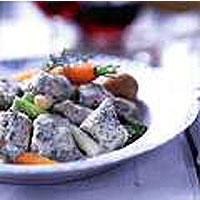 Combine the meat and the sauce and serve with boiled new potatoes and the reserved vegetables. This recipe was first published in March 1999.